This year I requested an absentee ballot with the intention of sending it in well prior to the mail in date. 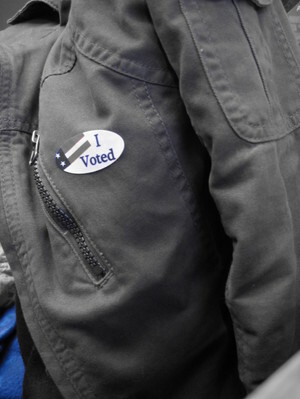 That didn’t happen, however the feeling of walking by a long line of people at the polling place to drop off my ballot and get the “I Voted” sticker was almost as thrilling as this evenings returns are sure to be. Plus the sticker will entitle me to one free drink at 7 Grand if I’m one of the first 75 to show up proudly displaying said accoutrement. 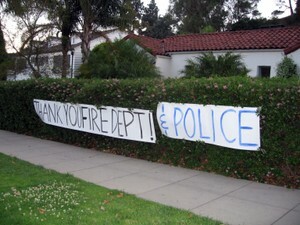 There are a number of ways to say thank you to the men and women of the LAFD, not just for their efforts of the past few days but for all their hard work year round. Or you could stop by your local Fire Department this Saturday between 10am and 4pm for the Fire Service Recognition Day, Open House. I'll be doing the Revlon Run/Walk 5K in the morning but I'll be sure to stop by my local station afterwards. 5:00am. I count 3 helicopters that have moved in and parked over my apartment to hover and assess the damage I guess. 5:25 am. Just went outside, I stand corrected...4 helicopters. All roads north of Franklin where I am are closed including the one I'm parked on so I suspect Los Feliz is closed too...One would assume the entire length of Los Feliz. 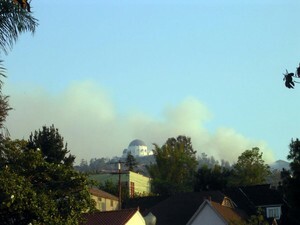 No flames can be seen but there is smoke behind and to the left of the Observatory. I think I'm gonna go for an early morning walk now. Definitely can't get back to sleep. Sounds like helicopters are moving east slowly. 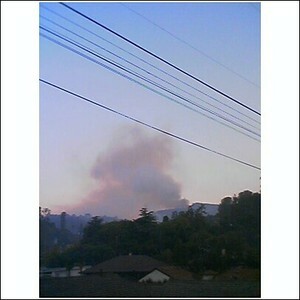 At first there was black smoke where there is now white smoke...that's a positive sign right? Little did I know today at work when I took this picture that it'd be all over the internet just a few hours later. 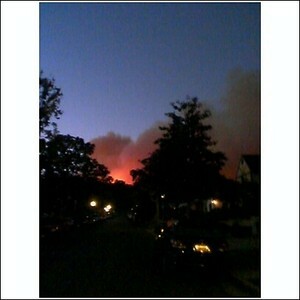 I got home around 6:45pm and decided to take a walk up the hill. 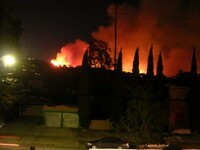 Yes, the hill that is currently engulfed in flames. I could have walked to the west but that wouldn't be adventurous so I decided to head east. At the top of Woking Way people were beginning to voluntarily evacuate. I was breathing tons of very unhealthy air at this point and had covered the highest hill I could reach so I headed down into the "flatlands" where firechasers had started to congregate. 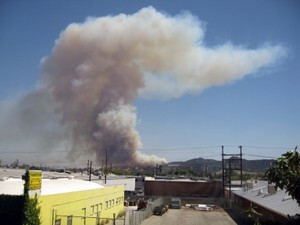 At that point I heard there was mandatory evacuation for the top part of Commonwealth. 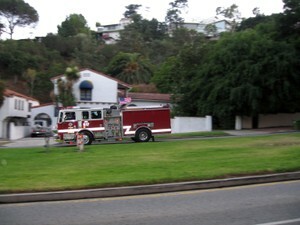 I continued down to Los Feliz where eastward traffic was gridlocked due to traffic light outages. All along the way people were lining the streets to get a look, amazed at how close it was getting to the residential area and how far West it was starting to spread toward the Observatory. I came back to my place and grabbed my camera, at the same time my neighbor had just jumped up to his rooftop. I asked if he had a ladder available so I could get up there and that's the advantage point of the following picture. 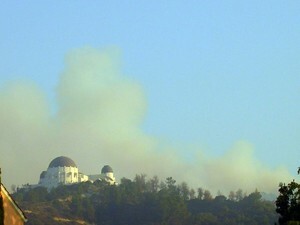 The teeny tiny little white dots just to the left of the fire is the Observatory. I have a feeling we will be hearing sirens and helicopters all night long. 12:45am UPDATE: Looking out from the front of the apartment building there's no orange hue to the sky anymore...and no visible flames. That's a good sign. I do hear helicopters continually in the distance still. Hopefully this is getting under control. Last night was the Ambassador Wake, which was held in the lobby of the Gaylord Apartments and HMS Bounty. Insane amounts of people were there and part of me wishes it was a more subdued affair as originally planned by Mike from Franklin Avenue and The Ambassador's Last Stand. 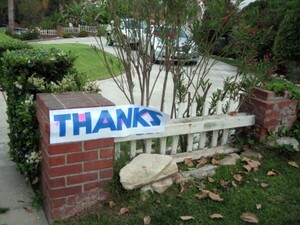 But this is L.A. and far be it from me to prevent the paparazzi from making a buck or two. On the plus side, I met a few local bloggers whom I enjoy on a daily basis. Oh yeah, baby. I get around, on the Internet that is. In no particular order there was one of the many Josh's from Curbed LA, who thinks I'm the nuttiest girl this side of Western...and he could be right. Then there was Pat from Eating L.A. who I instantly recognized, Jillian (a new voice over at blogging LA), Jim (Celia's little Trained Monkey) and the ever infamous Celia herself of 5th and Spring. On the non-blogging side of things we had Eric Lynxwiler of "that new Wilshire book" fame with his good friend Lynn Zook, Dave (the best bartender the Golden Gopher has ever seen), Craig Havens who's a damn good photographer, Bill who subcontracts for the LAUSD and worked on the demo of the building and some tall drink of water at the end of the bar that I briefly made eyes with. There were about 250 other people that I failed to meet...probably because we were holding court at the bar instead of mingling. The evening was a very nice tribute to a building that undoubtedly helped shape numerous aspects of Los Angeles' history. Early on in this fight to save The Ambassador Hotel, just after the initial EIR, I attended a community meeting to listen to and discuss the alternatives to demolition. Now I can debate from here to get out on the pros of Adaptive Reuse, however it was then that I realized this was a no-win situation. The LAUSD has strict codes for classroom size, among other things. It was simply easier to demolish and construct new to their specifications than reconfigure and reinforce an already compromised structure. Perhaps I would feel more impassioned had I experienced the glory of the building in its heyday. Regardless, we should cherish the memories and look forward to a new generation who will hopefully one day understand what all the fuss was about. I took a minimal amount of pics which can be found here. Do you think this woman is over her job yet??? As many as 500,000 people in southwestern Louisiana, many of them already displaced by Hurricane Katrina, were told to evacuate. And for those who refused to leave, Gov. Kathleen Blanco advised: "Perhaps they should write their Social Security numbers on their arms with indelible ink." I must say, after my life altering experience on Saturday, I've been rather uninspired to type about anything. Rather, I just want to let that last post sit for a while. Jumping out of a perfectly good airplane definitely was the best event of my entire 35 years of existence. However time continues and one should not live in the past so I must plug onward with the entries. I hesitate to post about the various drinking adventures that will most likely take place this week (Broadway Bar on Wednesday and The Golden Gopher's Anniversary on Thursday) because I'm starting to feel like a broken record. Then I logged onto the Downtown News website seeing as how I've failed yet to pick up my copy of this week's paper and low and behold an article struck me as interesting. And like that (snap) inspiration has returned. The article in question was written by David Friedman and is an opinion piece on how to revitalize not only the economy but the greater urban landscape of both Chavez Ravine and the Los Angeles River. In a nutshell, he proposes relocating the baseball stadium to the western bank of the Los Angeles River in close proximity to Union Station and converting Chavez Ravine into a great urban park, one that could rival other larger known parks in major cities. Anyone who knows me knows that I would be the first person to throw my body in front of any wrecking ball slated for Dodger Stadium however David's proposition is intriguing. What's happening to me? A historical preservationist toying with the idea of messing with such history? Well, I am also an Angeleno who wants to see progressive positive action towards the betterment of this great metropolis. It's all the rage in Los Angeles these days. King Tutankhamun, or just Tut to most folks, is back. Like all good children of the 70's I was fortunate enough to see the exhibit the first time around. Granted I was 6 at the time and it was The Smithsonian but I really do have a vivid recollection of that day. You see the lines were long, real long, and my parents had a friend who knew just about every scam in the book. So taking a cue from him, my dad took me along on a scouting expedition through the halls of the Smithsonian until we happened upon a freight elevator that deposited us where else but directly in the middle of the exhibit. My dad gave me explicit instructions to wait there for him and he said would be back. Thankfully that was a time when you could just leave a kid hanging around a busy museum and not fear their abduction and I did what I was told...waited for his return...with the rest of our clan in tow. Sneaky bastards. With today's security and restrictions you could never get away with that type of trickery...or could you??? Not like a lot of other people, I've been lucky enough to travel to Egypt. The year was 1997 and I went on a Mediterranean cruise with my grandmother. One of our stops along the way was the fabled Egyptian Museum where once again I was able to view the King Tut exhibit. It was a bit crowded so intimacy was lacking. Also during my visit to the Egyptian Museum I had the chance to visit the "Mummy Room" which I believe was "on loan" - possibly from the British Museum. The room was dark and cold and there were about 8 mummies displayed in various stages of wrap and un-wrap. THAT was interesting. And now, finally, Tut and I shall have our 3rd such rendezvous. 3rd time's the charm huh? I'm thinking the middle of September, on a Wednesday. Give a day to L.A. and join L.A. Works special one day event L.A. Works Day on June 11th. This one-day community service event typically draws hundreds of people together to do various community improvement activities. Painting, planting, cleaning - you know, fun stuff. All the while you'll be helping local non-profit organizations who strive on a daily basis to improve the quality of life for those of us less fortunate. Yes, you have to be at Cal Plaza in Downtown at 7:30 in the morning, but you can go home and nap afterwards. And who doesn't love a good afternoon nap? Yes, there is a $25 sign-up fee, but the fee helps L.A. Works with funding throughout the year so they can do this on a regualr basis. HOWEVER, let me let you in on a little secret. You can sign-up to be on the Los Angeles Downtown News team and have the $25 fee waived. The LA Downtown News is my absolute favorite newspaper and if you're interested in anything and everything related to Downtown Los Angeles then this is a must read newspaper. It's free and you can pick it up at any number of locations throughout Downtown and the general Eastside area. I'm doin' it and you should too.